So, last Thursday, I finally gave in and gave my doctor my application for a handicap placard. She happily completed her portion of the form on the spot, and I took the form to my local DMV the next day and got my placard. I have friends and family who have been pushing me to get one for quite awhile, because I get so fatigued from walking and it increases my chronic leg and foot pain. I had (and have) mixed emotions about this major step in my journey. As a social worker, I am well aware of the vast spectrum of disabilities and limited resources. So, in my mind, there are a limited number of handicapped parking spots, so who am I to park in one of those spots when there is potentially someone more disabled than I, someone more "worthy" than I of having that spot? What about people who are actually in wheelchairs and they need the extra space that handicapped parking provides? On the other hand, I know how tired am as the day goes on. No. Correction: I know how exhausted I am as the day goes on. I know when I have to go to the mall to run an errand, one of the first things I think of is how hard it's going to be to find a parking spot and how I'll feel completely done before I even make it into the mall entrance, let alone how I'll feel by the time I get to the store I need to go to, and then how I'll be when I get back to the car. I also know that a simple trip to Target or other big department stores also leaves me tired and in significant pain. But ultimately, I know that I need to take care of myself or I won't be able to take care of anyone else. I need to preserve what energy I have for the things that matter most. And, I need to take advantage of every opportunity and short-cut I can take to get the most out of my days because I know that more often than not, it takes all that I have to make it through an average day. I've just recently began blogging about my journey with chronic pain. You can read more about my journey here. If you are eligible for a handicapped placard, you can get the form online by going to the DMV website for your state. This little guy joined our family in December and quickly stole our hearts! As I shared before, we lost our chocolate lab back in July. Our home and my heart felt so empty with him gone. While I knew we could never replace our beloved Hana, I also knew another dog could bring some joy into our home; joy I desperately needed because I was still pretty depressed after all the grief I endured. Given Taylor's severe dog allergies and asthma, I knew another lab was out of the question. I've always loved Golden Retrievers, but with their long hair, that would also be an allergy nightmare. 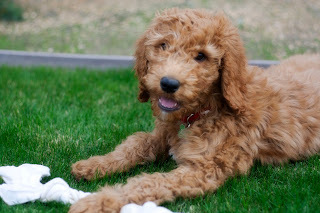 A friend suggested we explore getting a Goldendoodle. 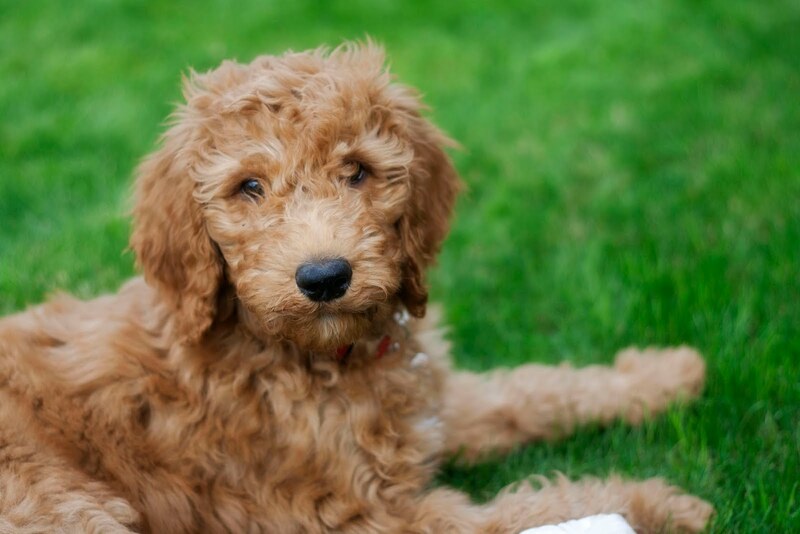 A Goldendoodle is a Golden Retriever/Poodle mix. So, I did some research. These dogs have the temperaments of Golden Retrievers and the intelligence of both breeds. 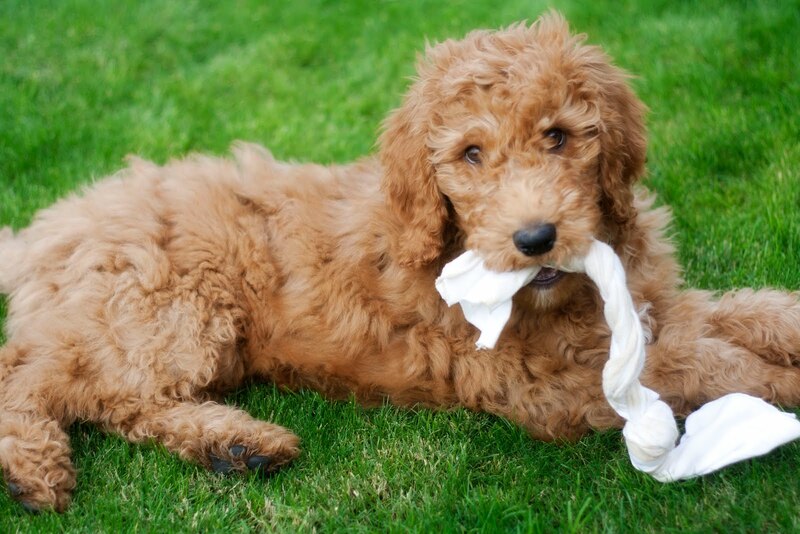 I never knew poodles are so smart! They are highly trainable and are great dogs for people with allergies because the poodle genes make them hypoallergenic. 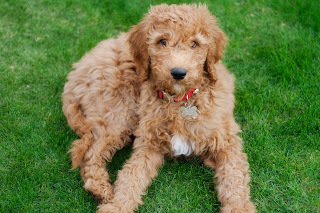 In my research I learned that an F1B Goldendoodle is the offspring of a Goldendoodle mixed with a poodle. Thus, the puppy is 3/4 poodle 1/4 Golden Retriever. Don't get stuck on the math (not my strong suit). My point is that the F1B is recommended for families with severe dog allergies. So, an F1B was the right choice for us! We got him from a family breeder a couple of hours from our home. We got him a few weeks before Christmas and he was the best Christmas present EVER! He's 13 weeks old in all of these pictures. He weighed about 22 lbs when we got him at 11 weeks! He's a standard size Goldendoodle so he's going to be a big guy. Now, at 7 months, he weighs about 53 lbs! I love big dogs and I fully believe that big dogs can be lap dogs! Hana was a lap dog and Barkley is, too. How could I deny couch cuddles to such a cutie? I'm feeling like I should rename this blog "Medical issues take over a Crafty Mom's Life". I'm emerging from under my rock and doing a little more creating. I've been going through a lot lately, both physically and emotionally. Grab a cup or glass of your favorite drink and I'll update you on my medical stuff and then I'll update you on some fun artsy stuff. I'm having severe, chronic pain and incredible fatigue. This has been going on for months (at it's worst). During my childhood, I had significant foot and leg pain and limited ability to stand or walk for extended lengths of time. I would tire easily when shopping. I was always at the end of the line on field trips working hard to keep up with my classmates. As I grew, I developed very high arches and "hammertoes" which means my toes all curled under. I have no idea how I worked as a cashier as a teenager, because I was in such incredible pain from standing and I would come home and literally collapse. When I was about 11, I saw an orthopedic surgeon at The Hospital for Sick Children in Toronto. He quickly determined I would need surgery to correct my high arches, curled toes and misaligned heels. I had 3 separate surgeries at age 12, 15 and 17 to correct all of this. Each time, the surgeries were done on both feet simultaneously.Since my first surgery, I've worn custom orthotic inserts to help support my arches and alleviate pain. Ultimately, I learned over time, the surgeon believed I had classic symptoms of Charcot- Marie -Tooth Disease (CMT). This is a genetic neuro-muscular disease that often presents with the symptoms I described. In the last 10 yrs there has been research done to identify the genes related to CMT. I've gone through my life under the assumption that I have this disease and that I've just never been formally diagnosed. The good news is, eventually in my 20's I began feeling reduced pain and symptoms. I became more active than I've ever been and became an avid hiker. While I still appeared to become more fatigued than my hiking mates, and took longer to recover, my CMT was practically a non-issue for me. That is, until about a year and half to 2 years ago. I began twisting my ankle frequently. Nothing serious, and I would generally recover within a few hours or a day. My ankle would just turn over every now and then while I walked, resulting in a limp when injured. This began happening more frequently and became quite painful. I finally saw my primary doctor for this about a yr ago and as a result I had my inserts updated in hopes to resolve the issue. Well, it didn't. I began having a steady increase in symptoms over the next yr or so and I've experienced an aggressive progression in the last 6 months to a year. Recently, I've realized my body is misaligned in general. I have one leg longer than the other, my knee caps don't line up and their misalignment can't be explained by the differing lengths of my legs. As a result of this, I've been having back pain and hip pain. My right foot also points outward toward 2:00 if using a clock face as a guide. My right knee is somehow involved in all of this and I'm having knee pain. My 3 biggest issues at present are significant ankle pain, incredible nerve pain in both legs and feet, and horrible fatigue and poor endurance. For the last few months, I've been feeling totally completely spent by 3:00 in the afternoon. As I've mentioned before, I'm a hospice social worker and I work from home doing charting and phone calls and then I visit my patients and their families in their homes. My health has been so poor recently that I've only been able to do the bare minimum work-wise, and this leaves me completely exhausted by 3:00pm and lying on the couch until bedtime. If I'm lucky I can catch a nap, and then it all continues the next day. This is a completely drastic change from who I was 2 or 3 years ago. I used to be very high energy, hardly able to sit still. I finally reached my breaking point last week. I had an appointment with a neurologist to pursue an actual diagnosis of CMT and get an appropriate treatment plan so I can function. He isn't convinced I have CMT and I have some follow up tests scheduled. While in his office, we realized I have muscle atrophy (muscle loss) in my right leg, which can certainly be contributing to my leg fatigue. So much so, that it's visible by just looking at it. In the meantime, my primary doctor has put me out on medical leave because I can't continue the way I have been. I just don't have the stamina and endurance to make it through the day and keep up with my workload. She's increased my medication for nerve pain, and hopefully the time off work will help me adjust to the side effects of dizziness and drowsiness. Each day this week I've been feeling better and better. The scary thing is, I know I'm feeling better because I don't have the physical and emotional demands of work. I'm not exactly sure where that leaves me, but I'm trying to just take one day at a time while exploring my options. I'm nowhere near being 100% and pain, fatigue and limited endurance still play a major role in my days, but I'm better than I was a week ago. Anyway, this has all taken it's toll on me physically and emotionally. CMT is a progressive disease, but somehow, when I was doing so well in my 20's, I guess I didn't think it was going to get any worse for me. Ironically, one of my best friend's has CMT and her CMT is very progressed. She is on disability because of her chronic pain and weakness and how it impacts her ability to function and complete simple tasks. In the late stages of the disease, the hands are affected and hand dexterity is greatly diminished. There are times in the last 2 years that I've looked at her and watched the progression of this horrible disease and thought "Is that my future?". Right now, I don't really know what the cause of all my symptoms is, and it's quite possible I have more than one condition or disease at play. I've had a work up for Rheumatoid Arthritis and although I've tested negative on bloodwork before, I've been referred to a rheumatologist. I also had the bloodwork repeated this week and am awaiting the results. So...what's getting me through all of this? Aside from my wonderfully supportive husband and friends, ART! I've finally decided to force myself to create everyday because I KNOW how therapeutic art is for me. I KNOW art is my happy place. I used to feel so at peace and invigorated when I went hiking. I haven't laced up my hiking boots in almost 2 years. 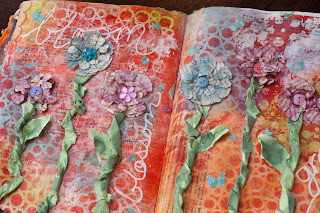 But I can still pick up a paintbrush and I can still go wild in my art journal. Yes, I need to take frequent breaks because I can't sit or stand for any significant amount of time. But, in mixed media art, I create so many layers that often breaks are needed to help the layers dry, or to figure out where to go next with my creation. Somehow, in the midst of my fatigue, I've made making art a priority and I was so frustrated by the state of my art room that I completely organized it and turned it into a space that I love to be in, and is (almost) totally functional! 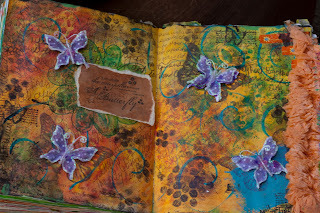 As I feel up to blogging, I'm hoping to share more of my journal pages, and share with you how I got started making art journaling one of my go-to pick-me-ups when I need to work through or escape the pressures of life. 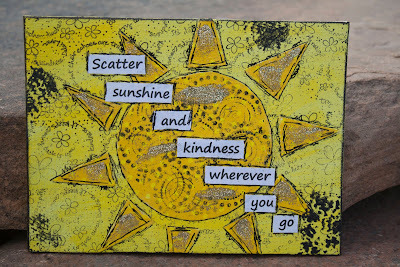 I'm a huge proponent of the therapeutic benefits of art making and journaling. I'd love to inspire you to grab a journal and a few favorite supplies and you to explore the process, too!